Munich - With decision-time fast approaching on UEFA’s Best Player in Europe award for 2012/13, FC Bayern Munich's is one of the three shortlisted hopefuls alongside Lionel Messi and Cristiano Ronaldo. The latter duo have dominated the continent's individual honours scene - and indeed the world game - in recent years, but if Bayern's French wing wizard were to take home this particular trophy on 29 August it would come as no great surprise. Now 30, Ribery made his real breakthrough with Olympique de Marseille in 2006, going on to be an ever-present in France’s ill-fated FIFA World Cup campaign in Germany that summer. Despite the team's overall shortcomings, Ribery's own performances were praised by national icon Zinedine Zidane, who labelled him “the jewel of French football”. When FC Bayern captured said jewel in 2007, then-club president and current honorary president Franz Beckenbauer likened it to having “won the lottery,” in the face of stiff competition for Ribery's services. The new signing duly lived up to his billing, helping Bayern to a domestic double in his first Bundesliga season and being voted Player of the Year in both France and Germany. Ribery’s ten Bundesliga goals and 14 assists last term tell their own story, and he provided the assist on five more in the UEFA Champions League. Most memorable among the latter was his clever pass to Arjen Robben for the last-gasp winner against Borussia Dortmund in the competition's showpiece Wembley final last May. The fact that the one Bundesliga game the men from Munich lost in 2012/13, against Bayer 04 Leverkusen, was played without their injured No7 is a further indication of his importance to them. He was also ruled out of the 2-0 home defeat to Arsenal FC which almost cost Bayern a place in the Champions League quarter-final. Coincidence? Surely not entirely. 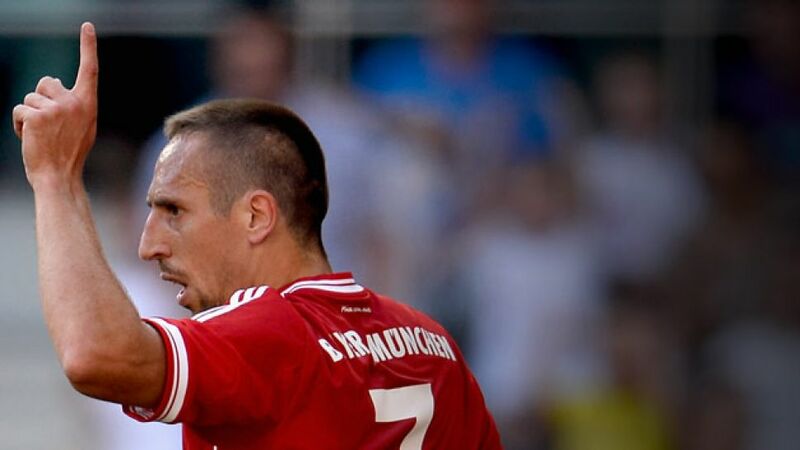 A record of 54 goals in 160 Bundesliga games would be the envy of many top strikers, yet Ribery’s main task is to cause maximal disruption in and around opposition penalty areas and carve out opportunities for his team-mates, rather than provide the finishing thrust himself.